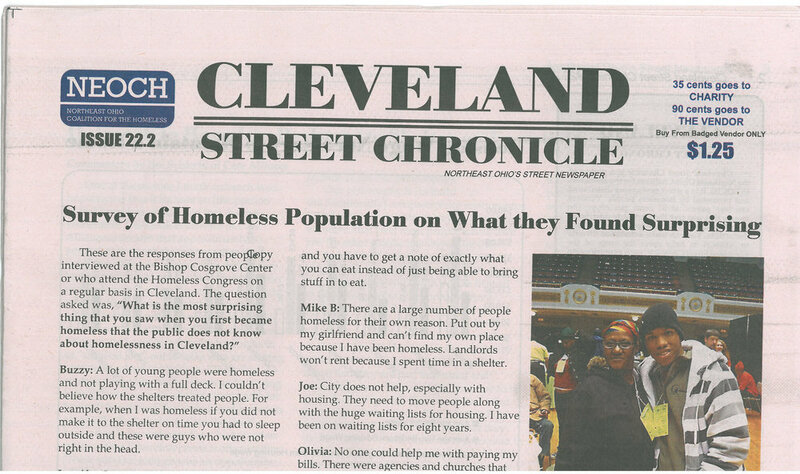 The new Street Chronicle #22.2 is available in Cleveland right now. It has a survey of the most Surprising thing found by homeless people when they first became homeless. We have a number of photographs, and a few pieces of poetry. There is an article about the importance of outreach along with a few local news reports. A volunteer did a story about interacting with residents at both the men's shelter as well as the women's shelter and the differences. I did a commentary about the results of the 2012 Police Chase that resulted in the death of Timothy Russell and Malissa Williams. All the vendors submitted stories including one on social media and the obstacles that Steve Harvey overcame. NEOCH's Annual Meeting was featured in the middle section of the paper along with a story of the Criminalization conference in Denver. One vendor had a run in with the clean up crews in Ohio City and the bank door that was left open. There were two stories on homeless veterans composed by two vendors. Thanks to PM Graphics in Streetsboro for the printing of the paper.